Former Nottinghamshire batsman Scott Elstone (left) has signed a one-year incremental contract with Derbyshire CCC, after impressing in the Second XI in 2013. The Falcons agreed terms with the 23-year-old, but have released Alasdair Evans whose one-year contract has come to an end. 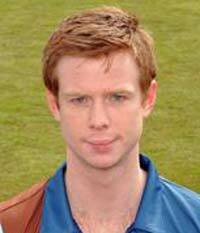 Chesterfield born batsman, Ben Slater has also not been offered a contract at the present time. Elstone scored 872 runs at an average of 35, including four fifties and one hundred, during an extended trial period in 2013 - as well as making his Derbyshire debut in the Yorkshire Bank 40 match versus Essex. Burton born and a product of the Nottinghamshire Academy, Elstone played 34 limited-overs matches for the Outlaws prior to departing Trent Bridge in 2012. He has averaged 35.83 in one-day cricket for the Unicorns this season including a top score of 75 not out, from 78 balls, versus Somerset. "Scott's got a big chance now," said Head Coach Karl Krikken, "He's done well in the Second XI this season, he looks a really good pro, he's got a lot of talent and good luck to him; I hope this is the start of a long Derbyshire career." Krikken, meanwhile, thanked Evans and Slater for their efforts in a Derbyshire shirt. 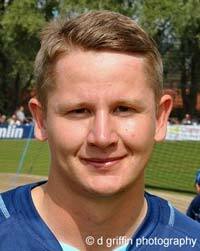 Chesterfield lad, Ben Slater's impressive start to the season in Second XI cricket earned him a run in the first team during the latter part of the 2013 season, where he contributed 335 first-class runs, in ten matches, at an average of 19.70. Alasdair Evans, (left) meanwhile, was limited to five first team appearances in all competitions but was a regular in Second XI cricket throughout the year. Krikken said: "Ally and Ben have worked their socks off this year - and the effort they've put in makes these decisions very difficult. "But we have to balance our budgets and we need to tweak the squad ahead of the new season; to do that we have to make some big calls. "One of those calls is that Ally will be leaving the Club and - at present - we're not in a position to offer Ben a contract either."